The needs of an aging national population and rapid advancements in medical technology are driving growth in the healthcare industry. Demand for qualified professionals increases with the construction of new hospitals, clinics, and assisted living facilities. The Bureau of Labor Statistics (BLS) projects that jobs for medical and health services managers will increase 20% by 2026, nearly triple the growth rate for all occupations. Earning a PhD in healthcare administration online helps current professionals improve employment opportunities and increase earning potential. An online doctorate in healthcare administration distinguishes job candidates from other professionals and qualifies degree holders for high-level positions. The following guide discusses how to choose and finance DHA online programs. Liberty University Online ranks among The 5 Best Online Doctorate in Healthcare Administration Programs! Liberty University is regionally accredited from the Southern Association of Colleges and Schools Commission on Colleges. Central Michigan University ranks among The 5 Best Online Doctorate in Healthcare Administration Programs! CMU is regionally accredited from the Higher Learning Commission. University of Mississippi ranks among The 5 Best Online Doctorate in Healthcare Administration Programs! The University of Mississippi is regionally accredited from the Southern Association of Colleges and Schools Commission on Colleges. Franklin University ranks among The 5 Best Online Doctorate in Healthcare Administration Programs! Operating a central campus in Columbus, Ohio, in addition to over 20 satellite campuses throughout the Midwest, Franklin University expands its national presence through distance learning. The school’s online doctorate in healthcare administration program aims for flexibility above all. Students never have to visit campus to complete their degree, and transfer students may bring up to 24 approved credits with them. Students often complete their degrees within three years. The 58-credit curriculum includes a research core, major courses, electives, and a dissertation. Major coursework includes topics like healthcare economics and healthcare policy, for example, and the dissertation usually accounts for each student’s final year of study. All applicants must have a master’s degree with a minimum GPA of 3.0. The program accepts students for spring, summer, and fall start dates. Franklin University is regionally accredited from the Higher Learning Commission. Medical University of South Carolina ranks among The 5 Best Online Doctorate in Healthcare Administration Programs! Based in Charleston, the Medical University of South Carolina is one of the oldest medical schools in the nation. 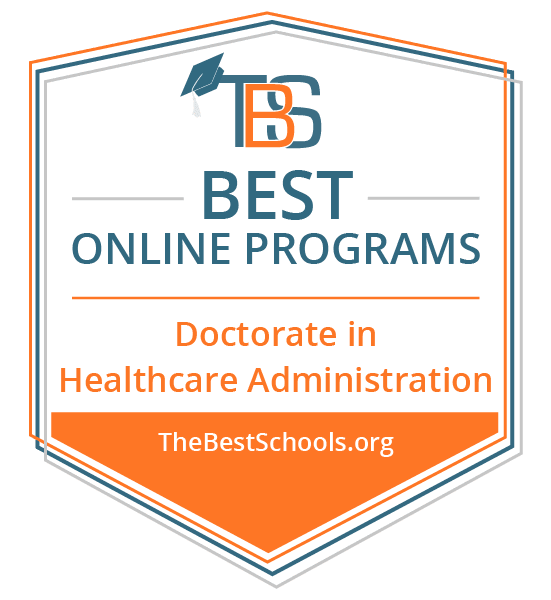 As a recent adopter of distance education, MUSC offers a unique online doctorate in healthcare administration — the DHA executive program. The program’s 63-credit curriculum takes approximately three years to complete. The first two years consist of asynchronous online coursework, with one weekend per semester required on campus. The final year takes place entirely on campus, with students working closely with faculty members on their dissertations. Prior to admission, all applicants must have professional experience in a leadership role (management or policy) in healthcare. Prospective students must have earned a master’s or professional degree in the field and demonstrate proficiency in statistics, epidemiology, health finance, health economics, and organizational behavior. The GRE and GMAT are not required for admission. MUSC is regionally accredited from the Southern Association of Colleges and Schools Commission on Colleges. Requirements to earn a PhD in healthcare management online vary by school. The following classes are common among DHA online programs; most students take some or all of these courses while earning an online doctorate in healthcare administration. Population health: This course provides a broad overview of epidemiology and explores strategies for predicting and preventing global, national, and community public health risks. Using case studies, students examine methods of standardizing health information, organizational policy development, and ethical and efficient resource allocation. Leadership strategies: This course explores established leadership theories and the relationship between effective leadership and efficient workplace operations. Coursework encourages self-reflection and personal development. Students strengthen the communication and management skills necessary to manage a team and enact positive changes in healthcare policy. Healthcare law and ethics: In addition to the historical foundations of current healthcare policies, this course covers recent developments and controversies surrounding medical legislation. Students investigate the social impact of healthcare reform and explore related moral and ethical dilemmas by examining case studies and enacting mock legislation. Healthcare economics: Students gain a broad understanding of fundamental financial and economic principles used in organizational finance strategies, including business plan development and corporate asset management. Learners explore marketing and funding concepts from both for-profit and nonprofit organizational perspectives. Coursework emphasizes the role of emerging technology in data-driven decision making. Research methods: In preparation for their dissertation, students examine various research methodologies, data collection and analysis procedures, and literature evaluation techniques used in clinical research. Learners identify research problems, design studies, and formulate hypotheses. Many students earn a PhD in healthcare management online in less time than is normally required to complete traditional, on-campus programs. However, the amount of time necessary to earn a DHA degree online depends on factors including enrollment status and program structure. While most full-time students require two to three years to earn a doctorate, curriculum structure, content, and delivery methods impact the time it takes to graduate. Flexible, asynchronous programs feature self-paced coursework and allow busy students to complete assignments and review course materials at their convenience. Self-motivated students with strong organizational skills can complete asynchronous classes quickly. Synchronous, cohort-based programs are highly structured and emphasize collaborative learning. While cohort programs offer peer and faculty support, they feature rigid deadlines and less flexible schedules. Most students take longer to complete a synchronous DHA degree online program. Accreditation is important to consider when researching DHA online programs. Accreditation ensures colleges and universities maintain high academic and ethical standards. Schools may hold regional or national accreditation; for-profit vocational and technical schools typically receive national accreditation, and most public, nonprofit universities are regionally accredited. Regional accreditation is more highly regarded than national accreditation. Credits earned from regionally accredited institutions transfer easily, whereas regionally accredited schools rarely accept credits earned from nationally accredited institutions. Because regionally accredited programs are often regarded as more prestigious, many employers prefer candidates with an online PhD in healthcare administration from a regionally accredited college or university. Employer tuition reimbursement programs generally stipulate the employee attend a regionally accredited institution. The U.S. Department of Education (ED) relies on accreditation status to determine which institutions are eligible for federal funding. While the ED does not award accreditation, the department oversees the six regional accrediting bodies. The Council for Higher Education Accreditation (CHEA) ensures that both regional and national accrediting bodies follow proper protocols. CHEA maintains a comprehensive database of accredited institutions. An online doctorate in healthcare administration leads to a variety of employment opportunities in the healthcare sector and elsewhere. Many graduates pursue management roles in hospitals and large medical facilities. Others lead nonprofit organizations, teach in universities and colleges, and secure high-level corporate positions. Careers for healthcare administration professionals, such as those below, require excellent communication and organizational skills. Medical and Health Services Manager: Also known as healthcare administrators, these managers coordinate medical services, hire and train staff, manage finances, and maintain records. They may be in charge of an entire facility, one or more departments, or a medical practice group. This position requires strong communication and interpersonal skills. Human Resources Manager: Human resources managers oversee the administrative functions of a company or organization, including hiring staff members, developing benefit and training plans, and securing regulatory compliance. They serve as a liaison between upper management and staff, mediate labor disputes, and oversee employee relations. Postsecondary Teacher: Many students pursue an online doctorate in healthcare administration to become a postsecondary instructor or professor. Professors typically specialize in one or more academic fields and teach at colleges or universities. Many postsecondary teachers also conduct research. Top Executive: The responsibilities of top executives vary by organization and industry, but most of these professionals develop policies, procedures, and initiatives that further organizational goals. Most have extensive managerial and administrative experience in a particular sector, and large medical corporations typically prefer candidates with a doctorate in healthcare management. Social and Community Service Manager: Tasked with coordinating social service organizations, these managers identify medical, economic, and social needs within a community or demographic. They develop and implement outreach programs, evaluate data to determine an initiative’s effectiveness, and modify programs accordingly. Most have a background in medical or social science in addition to managerial experience. Professionals with a doctorate in healthcare management typically earn higher salaries than those with a master’s or bachelor’s degree. However, individual salaries depend on factors including location, industry, and professional experience. As the table below demonstrates, professionals with more work experience generally earn higher salaries; some late-career professionals in the field average nearly double the salaries of entry-level employees. Professional organizations benefit both current students pursuing a DHA degree online and working professionals in the industry. Professional organizations offer members opportunities to gain new skills, boost their resumes, and make valuable industry connections. Common resources for members include career services, continuing education, and scholarship opportunities. These organizations provide a forum for healthcare administrators to network, collaborate, and grow professionally. The groups below are ideal for students earning a PhD in healthcare management online. American Association of Healthcare Administrative Management (AAHAM): AAHAM promotes professional development and provides advocacy for current and prospective healthcare administrators. The organization offers five certifications and provides a discounted student membership rate and access to exclusive scholarships. Association for Healthcare Administrative Professionals (AHCAP): In addition to continuing education programs and free webinars, AHCAP members receive tuition discounts at sponsored institutions, career and resume assistance, and an invitation to the organization’s annual conference. Health Care Administrators Association (HCAA): This nonprofit association offers support and legal advocacy for third-party healthcare administrators. HCAA hosts seminars, conferences, and summits during which members build industry connections and gain new skills. Students earning a PhD in healthcare management online have a variety of options for financing their studies, including scholarships and tuition reimbursement programs. Complete the Free Application for Federal Student Aid (FAFSA) to determine whether you qualify for federal financial aid, including grants, loans, and work-study opportunities. While some learners pursuing a DHA degree online fund their education with private loans, federal student loans typically feature lower interest rates and more lenient payment plans. Additional funding options, such as work-study programs, may be available to students who intend to pursue employment with nonprofit or government organizations. These programs often require recipients to work in an underserved region or population after graduation. In addition to federal funding, there are many scholarship and fellowship opportunities available to students pursuing a doctoral degree in healthcare management. Institutions, corporations, special interest groups, and individuals award scholarships based on financial need, academic merit, and specialized criteria. Unlike student loans, students do not have to repay scholarship awards. Some employers offer scholarships or tuition reimbursement programs for employees pursuing higher education.